Showing 35 articles from April 27, 2016. LOUISBURG -- By the end of the year, Franklin County could finally have the emergency radio system it set out to get when it contracted with a Virginia company in 2010 to revamp communications. Lynchburg,Va.-based Harris Corporation built the county an $11 million emergency radio system that has been plagued by bugs, dropped calls and garbled audio since the county began using it in October 2012. 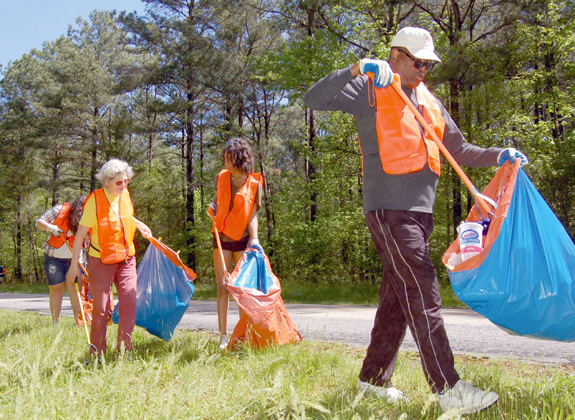 Joseph Fogg, front, along with, from left, Julia Benitez, Claudette Giani, and Briana Kelso, picked up trash along the side of Winston Street last Saturday as part of a joint effort between the Franklin County Solid Waste Task Force and OneFranklinton to clean up streets in town to recognize Earth Day, which was April 22. About 18 volunteers took part in the effort all across the town. LOUISBURG -- Attorneys have filed a class action lawsuit alleging an operator of three assisted living facilities, including one in Youngsville, is guilty of not properly feeding some residents, and leaving some residents to sit in their own waste and filth for hours. Attorneys for two former residents of Franklin Manor Assisted Living Center in Youngsville filed the complaint in Franklin County Civil Superior Court on Monday. The suit alleges that Cleveland, Ohio-based Saber Healthcare Group understaffed the Youngsville facility, as well as facilities in Clayton and Charlotte, to the point that some residents went without care, and many sustained falls that required hospital stays. 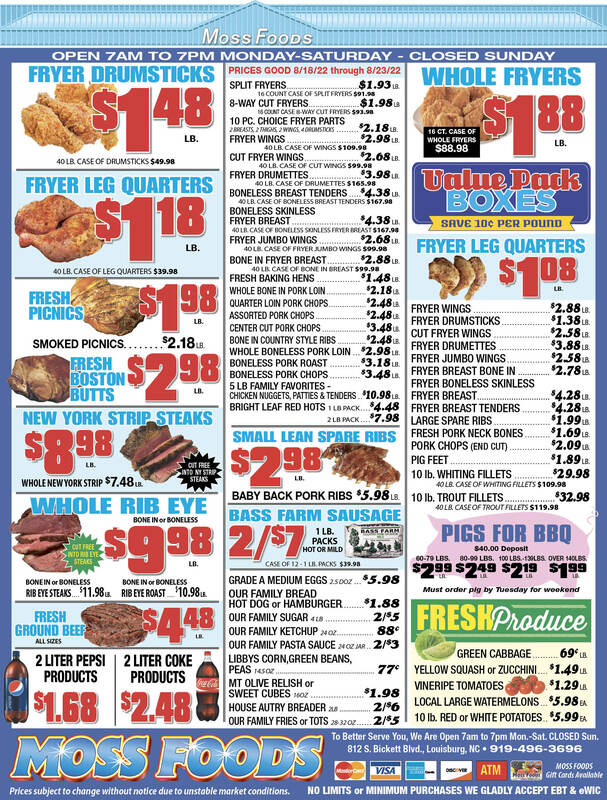 Beautiful, sunny days of springtime mean many things but one of the most tasty around here has to do with strawberries. Believe it or not, it's strawberry season -- and to put extra focus on that popular crop, the annual Strawberry Festival is slated for Friday, May 6, at the county Farmer's Market in Louisburg's Shannon Village shopping center . The event begins at 10:30 a.m. when all recipe entries are due. Judging will begin at 11 -- as will the serving of free homemade strawberry ice cream. LOUISBURG -- Things are beginning to sprout with Feeding Franklin. Its board of directors met for the first time last week. Volunteers began planting fruits and vegetables at a community garden located at the sheriff's office. And a community garden plot behind the Senior Center in Franklinton was sprayed for weeds two weeks ago. It was tilled last week and is expected to be ready for planting the first week in May. 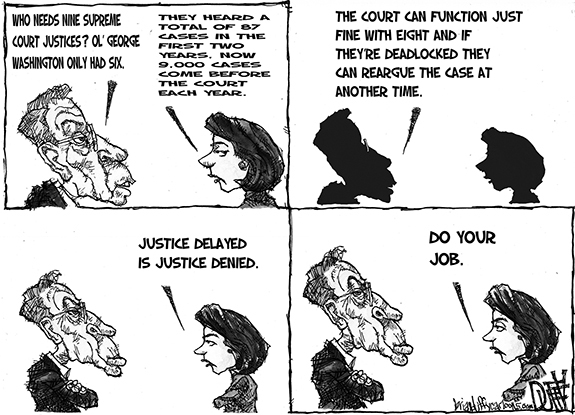 This is a great time to be a teacher of high school civics classes! If this year's presidential election isn't giving students and teachers plenty to talk about, I don't know what might. Unless, of course, it's the mess going on in Raleigh which, perhaps because it's so much closer and insanely costly, is a bit too close for a comfortable discussion. But, given the way the national primary "system" -- and yes it deserves those quotation marks because it's not exactly a rational system -- students, teachers, pundits and citizens alike are fascinated with the process. Three cheers for the folks in the Franklinton area who tackled one of Franklin County's most visible problems -- litter -- over the weekend. Organizers of an Earth Day event rounded up as many volunteers as they could find to take part in a Spring Litter Drive last Saturday. The event was coordinated by OneFranklinton and the county's Solid Waste Task Force -- and it was a big success. Members of the Solid Waste Task Force are planning to host and be part of other events that bring awareness to the problems created by litter which seems to be an increasing problem across Franklin County. Back in February, I wrote a column concluding that the federal government should hire people who were better at their jobs. What brought about that conclusion, you may ask? At the time, agents with the Federal Bureau of Investigation were trying to decrypt an iPhone that belonged to a man suspected of killing 14 people in San Bernandino, Calif., before himself dying in a shootout with police. Governator Pat McCrory may be on to something with HB2. It could be another part of his vaunted, but as of yet, non-existent, Carolina Comeback. North Carolina's unemployment rate is higher than the national average, but McCrory may have a solution: a massive state government hiring program for Potty Police. GET BACK. Bunn High School baserunner Davie Morgan (left) tries to avoid a pickoff during last Thursday evening's Northern Carolina Conference baseball game against the Franklinton Red Rams. 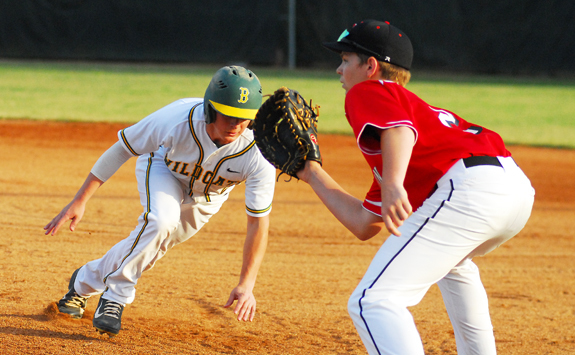 BUNN -- One big inning was all it took for the homestanding Bunn Wildcats to get past Franklinton last Thursday evening at the BHS Baseball Field. Needing a victory to stay in a tie for first place in the Northern Carolina Conference, the Wildcats plated 10 runs in the bottom of the second stanza alone en route to defeating the Red Rams by a 13-3 margin. Spencer Brickhouse, known more for his bat skills, earned the mound victory for the Wildcats. KEY PLAY IN THE GAME. Bunn's Erica Davis (right), who was seemingly about to be caught in a rundown, watches as the ball flies past the catcher during Tuesday evening's Northern Carolina Conference softball showdown against South Granville. 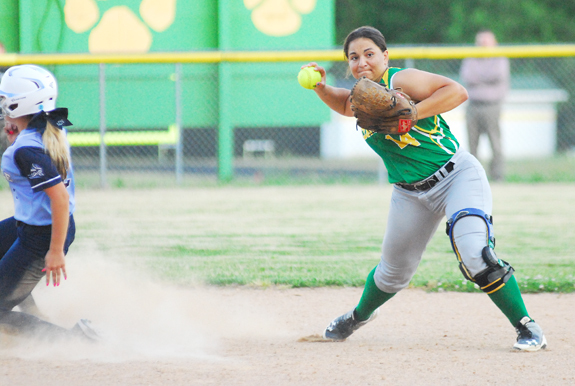 BUNN -- A shutdown pitching performance and a single mad dash home was the perfect recipe for the Bunn Ladycats to break their recent skein against Northern Carolina Conference opponent South Granville, which also happens to be the defending Class 2-A State Champion. 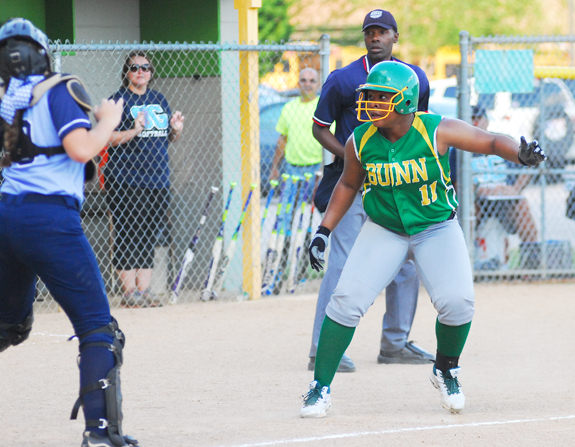 After winning the NCC last spring, thanks in part to two victories over the Vikings, Bunn dropped a series to South Granville in the semifinals of the Class 2-A State Playoffs. HERE COMES THE HEAT. Franklinton's Kyler Langworthy delivers a serve during last Thursday afternoon's home match against Bunn. 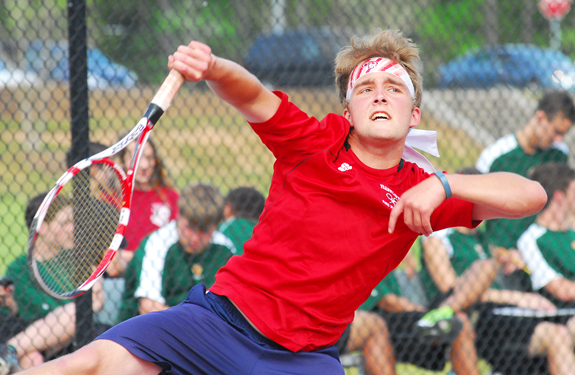 FRANKLINTON -- Prep boys tennis appears to literally be in good hands in Franklin County these days as both Franklinton and Bunn are fielding competitive rosters in the always-tough Northern Carolina Conference. Of course, tangling with powerhouses such as North Carolina School of Science and Math and Durham School of Arts can be a challenging proposition. 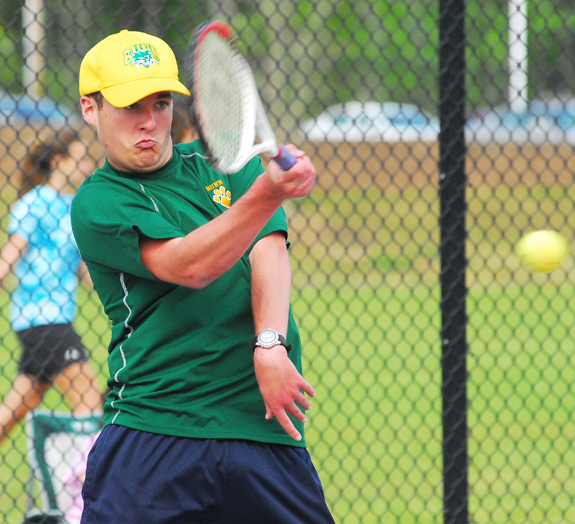 But FHS and Bunn have both been successful against some of their other rivals in the conference. BUNN -- A standout Bunn High School quarterback going to Elon University to play wide receiver. 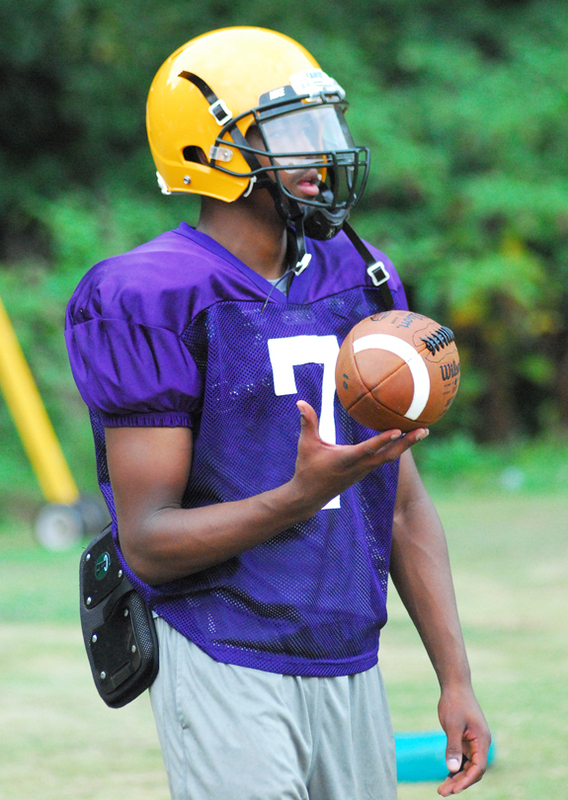 Five years ago, Bunn's Andre Davis signed with Elon as a receiver instead of the signal-calling position he excelled at during his prep days. Davis would end up lettering for three seasons for the Phoenix before finishing his gridiron career at Campbell University. WILSON -- Franklinton High School took first place in the boys and second place in the girls team standings at Monday's track and field meet at Wilson Fike. The Red Rams compiled 180 points, compared to 155 for second-place finisher C.B. Aycock. Aycock was the girls winner at 142 points, with the Lady Rams racking up 117 markers. 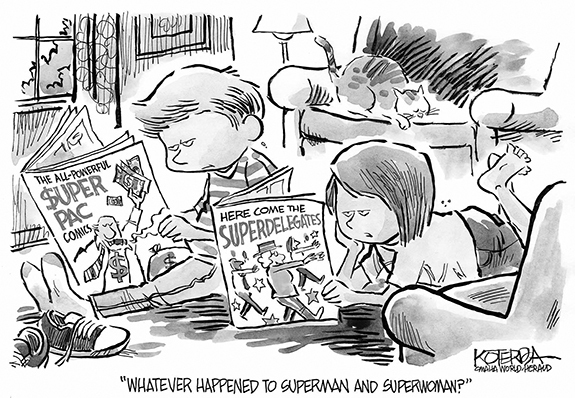 SUPER SEVENTEEN. 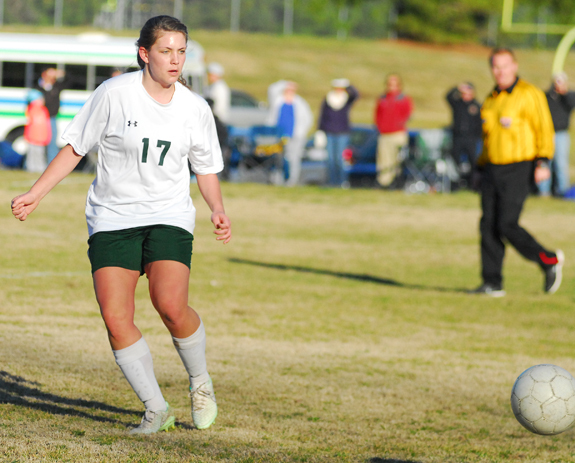 Bunn High School's Haley Jones, a four-year starter, has signed a letter-of-intent to play soccer for the Methodist University Monarchs in Fayetteville. BUNN -- Despite her easy-to-notice talents, finding Haley Jones on the soccer field hasn't always been an easy proposition during her four-year career at Bunn High School. That's because Jones' versatility allowed Coach Charles Haley to use her at several different positions with equal success. "There were some matches where Haley would be at every position on the field,'' Coach Haley said. "She was that good of an all-around player." 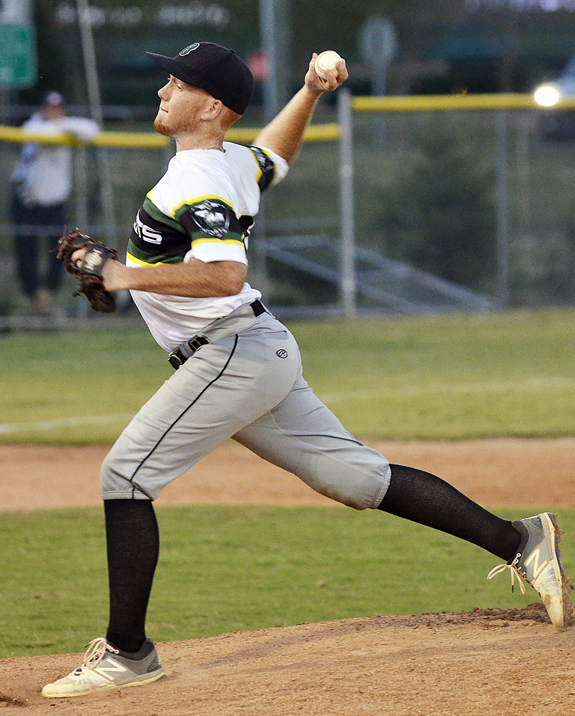 BUNN -- Josh Boone wasn't about to see the lights turned out on Bunn's chances to win the Northern Carolina Conference regular season baseball championship. After a 20-minute delay when someone inadvertently turned off the lever that activated the lights at the BHS Baseball Field, Boone delivered an RBI single in the bottom of the seventh to propel the Wildcats to a 4-3 victory over defending state champion South Granville. Bunn, with just one NCC setback, is now narrowly ahead of South Granville and Roanoke Rapids in the conference standings heading into the final week of the regular season. MYRTLE BEACH, S.C. -- The Myrtle Beach Pelicans held off another ninth inning rally while clinching a series victory with a 4-2 win against the Carolina Mudcats at TicketReturn.Com Field on Sunday night in Myrtle Beach. Stephen Gaylor was 3-for-4 with a RBI in the loss for Carolina. The Mudcats (7-11) outhit the Pelicans (10-8) in the game seven to three, but were just 2-for-10 with runners in scoring position and left nine men on base. CHAPEL HILL -- The North Carolina High School Athletic Association's 2017-21 realignment plan is one step away from fruition -- and would feature a split superconference that would include Louisburg and Bunn. The NCHSAA's third and final draft was presented last week and will be submitted for approval by the Board of Directors during a meeting on May 3-4 in Chapel Hill. The leagues will remain the same for the 2016-17 calendar year before realignment begins in the Fall of 2017. LOUISBURG -- The finale didn't go as planned, but first-year coach Michelle Carlson was thrilled with the progress her Louisburg College fast-pitch softball team made during its spring schedule. Louisburg's campaign closed last week with a 1-2 record at the annual Region X Tournament in Spartanburg, S.C. The Lady Hurricanes opened in style with a decision over the University of South Carolina-Sumter, but lost consecutive games to Spatanburg Methodist and USC-S to drop out of the double-elimination format. Bunn senior shortstop Stephanie Williams records a force play at second base. 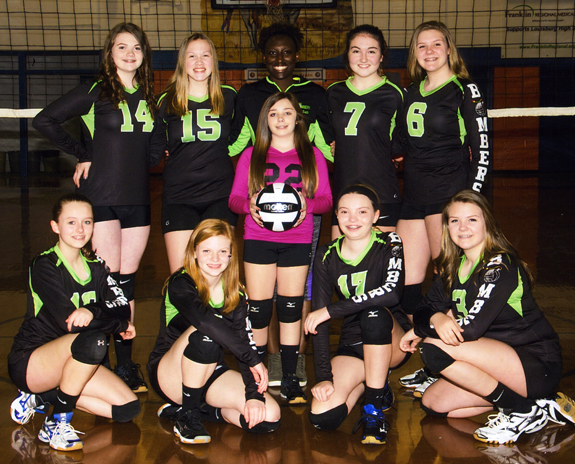 The Louisburg Volleyball Club Bombers Black 14-Under Team recently won the crown at the Carolina Regional State Championships. The two-day tournament was held in Asheville. Pictured are team members (back, l to r) Emma Hester, Chandler Parrish, Coach Aretha Battle, Kristen House and Dana Potter; (front, l to r) Cassie Edwards, Sarah Wood, Austin Hamlin, Maddie Wood and Diana Potter. A Franklinton first baseman goes to the ground to field a bunt during last Thursday evening's road baseball contest against the Bunn Wildcats. Noah Winstead returns the ball at No. 1 Singles for the Bunn Wildcats as part of last Thursday's road conference tennis matchup against the Franklinton Red Rams. 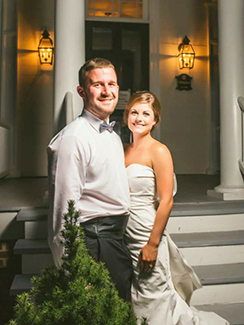 Sarah MacKenzie "Maggie" Wright and Daniel Christopher Sims were married Saturday, Aug. 22, 2015, at 6 p.m. at The Sutherland in Wake Forest, North Carolina. The Reverend Richard Thomas Clayton of Hayes Barton United Methodist Church in Raleigh officiated. Following the ceremony, the bride's parents hosted a reception at The Sutherland Pavilion. UPCOMING MARRIAGE. The Rev. 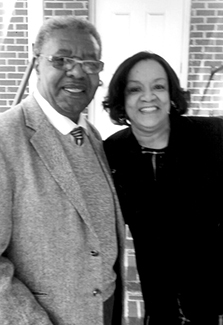 Junious M. Debnam and his fiancee, Margaret, will have their wedding at St. Stephen Missionary Baptist Church on Saturday, April 30, at 3 p.m. The Rev. Sheila D. Alston will be officiating. All members and friends are cordially invited to attend. BUNN -- For Jacob Stephens, music has always played a big role in his life. 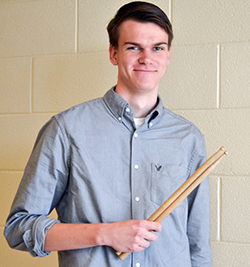 The talented percussionist and Bunn High School senior has spent his entire high school career striving for excellence so that he may perform in the prestigious North Carolina All-State Honors Band Concert. Very soon, Stephens' hard work will pay off. The All-State Honors Band will perform on May 1 in Memorial Hall at the University of North Carolina - Chapel Hill and Stephens will be playing the snare drum among the best high school musicians in the state. HENDERSON -- Vance-Granville Community College will hold commencement exercises dedicated exclusively to new graduates of Adult Basic Skills programs on Thursday, May 5. The ceremony will begin at 6 p.m. in the Civic Center on the college's Main Campus in Vance County. Those being honored at the ceremony will include students who have completed either the Adult High School Diploma program or the High School Equivalency program in the past year. 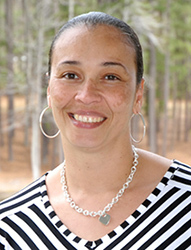 LOUISBURG -- The president of a local environmental technology company and the executive director of the North Carolina Council of Churches will be the featured speakers during Commencement week activities at Louisburg College, May 5-6. Approximately 140 students are expected to receive degrees. Jason Williams, president and CEO of PRTI in Franklinton, will deliver the Commencement address at 11 a.m., Friday, May 6, in the Jones Performing Arts Center (JPAC) on campus. YOUNGSVILLE -- Town staff are working to get loan documents to a state fiscal oversight group, moving another step toward entering a new town hall. Last month, commissioners agreed to pursue $650,000 in financing to buy a 7,500-square-foot building on U.S. 1-A near the National Guard Armory and Youngsville Elementary School. 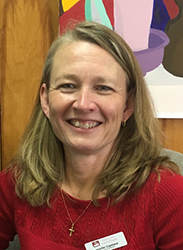 The agreement to pursue funding was with the understanding that paying off the debt on the loan would require the town to raise taxes as much as 5 cents per $100 of valuation -- a decision that would be made official with the adoption of the 2016-17 budget in either May or June. The North Carolina Senior Democrats, an official auxiliary of the North Carolina Democratic Party, is having its 2016 Convention at the Marriott Crabtree Valley, 4500 Marriott Drive, across from Crabtree Valley Mall, on Friday, April 29, and Saturday, April 30. Activities start at noon Friday and continue until about 3 p.m. Saturday. 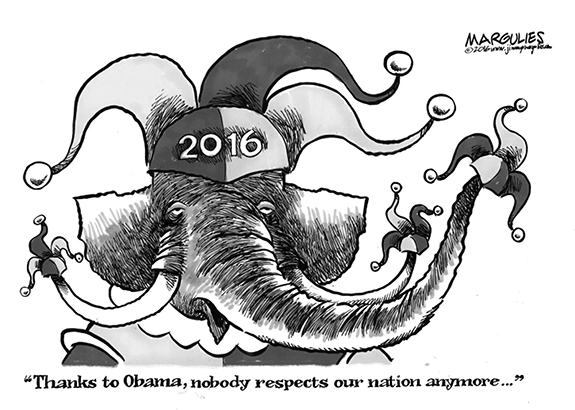 The convention will begin at 9:30 a.m. on Saturday. Coach Sam Jordan congratulates Aeryn Younger as he crosses home plate. 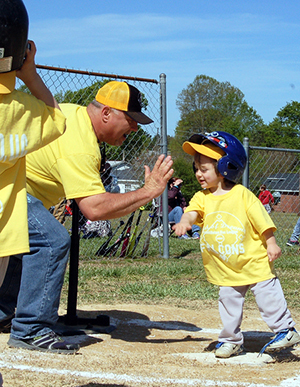 FRANKLINTON -- Last Saturday served as Opening Day and the revival of Franklinton's Parks and Recreation baseball program as teams of children, ages 4-14, filled three fields at Franklinton Elementary School to play ball. 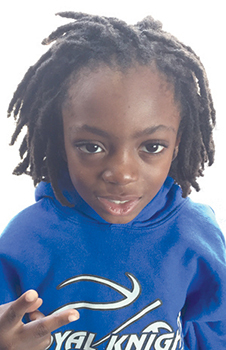 The renewal was a joint effort by the town's governing board, police department staff, parents, children and people and businesses who donated time, resources, equipment and money to get the program off the ground.